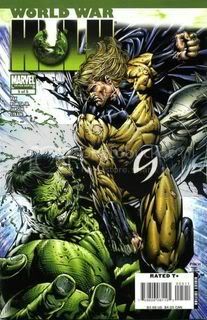 Now that every issue of WORLD WAR HULK is out there, as I said in my last posting, I figured it was time to do an extensive review of the whole series, an issue a day. It's part review, part criticism, part guidepath in general to the finer points of the smashfest. "This is the story of the Hulk. A monster who fell from the sky to the savage planet of Sakaar...a whole planet of monsters. But while they stabbled him...burned him...and ate his very flesh...he never forgot the real monsters...the puny humans who sent him here. Dr. Strange. Mister Fantastic. Iron Man. Black Bolt. They shot him into space. They thought they were saving their world. They thought he was finally dead. But he survived. Because he is the Green Scar...the Worldbreaker...the Eye of Anger...The HULK...and now he's coming home." Thus begins WORLD WAR HULK, with a monologue that explains, both in great visuals by John Romita Jr., and simple, elegant text by Greg Pak, just about every bit of what newbies need to know to get in on the action. Well, all right: not everything, but enough. Truth be told, while being an accessible tale on the surface, many of the nuances of the event will only be understood by those who are accomplished fans of the Hulk character, or at the very least, have read "Planet Hulk," the story which preceded it in Incredible Hulk v. 3 #92-105, now available in a hardcover edition. The denouement--which we'll get to much later--will in particular seem tacked-on to those who haven't read "Planet Hulk," but will make full sense in context. Pak establishes immediately that the Hulk is angry because he was left to die on an alien world. We don't yet know all the details, but know he has four chief targets: Iron Man, Dr. Strange, Mr. Fantastic of the Fantastic Four, and Black Bolt of the Inhumans. The Hulk has had close associations with all but one of them--Black Bolt and the Hulk, though they have met a few times, have never been what you'd call "close"...but Bolt did invite the Hulk to stay in the Great Refuge once upon a time (Hulk Annual #1, 1968). (Then again, he did try exiling the Hulk way back when, too--check The Incredible Hulk v. 2 #175 from 1974.) Is it any wonder, then, that the Inhuman is the Hulk's first target? There's the proximity issue, too: Black Bolt is on Earth's moon, whereas the others are on Earth proper. Outside of Dr. Strange and his mystic abilities, Black Bolt is likely the most formidable of the foursome, and his defeat here serves to convey the kind of message the Hulk wants: he means business. One thing seemed to annoy readers when the issue first came out: the battle on the moon between Hulk and Black Bolt takes place almost entirely off-panel! People didn't like suddenly seeing Black Bolt unconscious later. However I had to applaud Greg Pak for the restraint shown in this scene (or lack of a scene). In this day and age of instant gratification, where horror movies have to be gory to be effective in their audiences' eyes, it was refreshing to see someone remember that sometimes, it's what you don't see that's scarier. Readers had to imagine what the Hulk did to Black Bolt after the climactic "I wanna hear you scream" line. From the punishment that the Hulk received at the hands (er, voice) of Black Bolt on-panel, it had to be one wicked battle. Kudos to everyone for a thrilling cliffhanger moment and the best one-liner of the series. We should also see a few implications from the Hulk's announcement. Readers who weren't aware of the goings-on in "Planet Hulk" now can see that the Hulk of those adventures was an articulate behemoth, backing up his words with actions. It should not be forgotten that this Hulk returns to Earth not as one of its citizens, but as the ruler of a nation that sees itself as having been wronged. In the early days of this storyline, I likened the invasion by the Hulk and his Warbound as something as logical as if the U.S. shipped nukes over to some other country, and they accidentally went off and killed many thousands of that country's nationals. Of it'd be our fault that people were killed, because if we hadn't shipped the bombs over there in the first place, the other country's people wouldn't have been in danger and would not have died. The act, as seen as plainly as this, is one of war, no matter what the intentions behind it. After the initial buildup, the rest of the issue proceeds rather quickly once the 24-hour ultimatum passes. Seeing as Iron Man was the architect of the SHRA and is the most public by far out of the four Illuminati, it would make sense in the narrative to have him be the "Big Bad" with the others lining up to fight the Hulk in the interim. Greg Pak wisely avoids this trap, instead having the "face of the SHRA" rise to the occasion and enter first combat. Iron Man equips himself in a special "Hulkbuster" suit of armor, bigger than the Hulk himself, but the effects are predetermined. He broadcasts a speech about his intentions while the battle continues, taking full responsibility for the decision to send the Hulk into space in the first place. The fight and speech are broadcast by news helicopters practically worldwide, drawing the attention of the Hulk's first sidekick, Rick Jones (who evidently wastes no time using his Avengers priority clearance to jump on the quickest flight from Las Vegas to New York, arriving in time for next issue). The battle is interrupted by warplanes who launch missiles at the Hulk. The bombardment reminds him of his wife Caiera's death on Sakaar, and so enraged, he once again beats on Iron Man, driving him into the Sentry's aerie, making the structure collapse while the other heroes look on in an eerie parallel to the real-world collapse of the World Trade Center towers. (This event makes sense to both draw in the Sentry to battle later, and gives the event weight among the superhero community, with a building that is so highly regarded as the Avengers' most recent headquarters being decimated.) Finally, the heroes approach the ruins of the building, seeing something stirring, hoping it is Iron Man triumphant, only to find the rampaging Hulk emerge, growling and moving toward them. 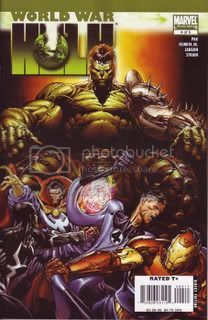 World War Hulk #1 is successful on many fronts, presenting a wealth of information to new readers, keeping momentum up for those who have just come over from "Planet Hulk," and flying in the face of expectations, chiefly in the "less is more" battle against Black Bolt and the rather unexpected "round two" battle with Iron Man. The plotting is tight, the script is decent, and the art by John Romita Jr. is very kinetic, showing that he's the best Marvel has at "big" action scenes. "Hulkinued" tomorrow with the big "Heroes Vs. Hulk" throwdown, as well as comments on "jobbing." Well, folks, the last time I mentioned the Hulk on this blog, aside from my having bought #1, Greg Pak was on board and I was interviewing him for the main title. 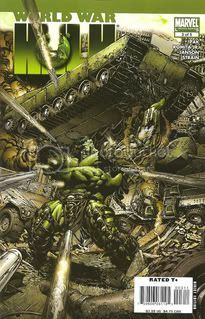 For those who haven't been following through PLANET HULK, the universe-spanning epic that is available in hardcover now from such fine folks as www.instocktrades.com, the Green Goliath was exiled to a faraway planet by some heroes he thought were his friends, but instead of going to the planet they intended, he smashed his way off-course and through a wormhole to a world where he could actually be hurt (gasp!). In true Russell Crowe fashion, he rose from slave to gladiator to rebel leader to Green King, taking a wife and gaining acceptance before having all his happiness taken away in a flash of nuclear fire. Of course, the madder the Hulk gets, the stronger the Hulk gets, and faster than you can say "puny humans," the newly-crowned Green King led a team of his monstrous compadres back to Earth for some (he believed) righteous vengeance. So was set WORLD WAR HULK. So now, WORLD WAR HULK is over, the fifth and final issue having shipped this last week. Is it any wonder I'm reviewing the whole shebang here? I'll post thoughts on one piece of the puzzle every day this week (and it may bleed into the week beyond depending on my schedule). I'll piece together everything and arrive at final thoughts thereafter. In a bit of foreshadowing, I'll just say that I think any forthcoming HULK writers have their work cut out for them trying to surpass what Greg Pak & co. have come up with in these five issues (and the myriad of tie-ins).